ATTACKER "Giants of Canaan" CD and T-shirt. Upcoming gigs. ATTACKER's new CD "Giants of Canaan" had its debut last Saturday at the Metal Assault festival (where the band gave a stellar performance), and has been already getting really enthusiastic response from the press (several 9/10 reviews) and fans on various metal forums. We have read a few opinions that it's not only on the level of their first 2 classic albums, but that it's THE best ATTACKER album so far! It's definitely a very classic sounding US power/heavy metal record with solid production, great songwriting and musicianship (especially amazing guitars! ), and the vocals of their new singer Bobby "Leather Lungs" Lucas fitting like a glove. 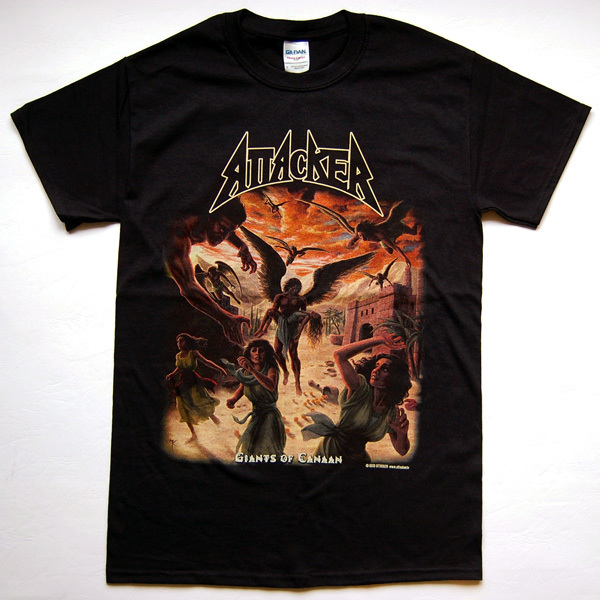 The new album can be purchased from our SHOP page - also in bundle with the T-SHIRT (see below) and with the reissues of the first two ATTACKER albums: "Battle at Helm's Deep" and "The Second Coming" (we got hold of them at the festival and as of now we have 12 and 14 copies available respectively). ATTACKER "Giants of Canaan" T-shirts have been manufactured by Fine Arts Merchandising and we're very satisfied with their high quality. After selling them at the festival we have 16 T-shirts left, available in all sizes (S, M, L, XL and XXL). See the SHOP page for the back print and details picture, and for the bundle offers! 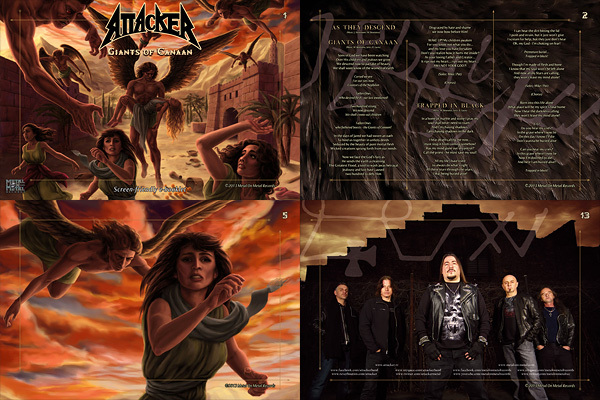 As mentioned before, the release of the new album coincided with ATTACKER's appearance at the Metal Assault III festival in Würzburg, Germany, where they shared the stage with MANILLA ROAD, BROCAS HELM, RAVEN, JUTTA WEINHOLD BAND, SKELATOR and others, followed by the headlining show at the Screaming for Metal festival in Madrid, Spain the next night. The band has more shows in the plans, including Childhood Heroes festival in March in New York (with HELSTAR, HERETIC, VIKING and WRATH), Warriors of Metal VI festival in June in Ohio (with MELIAH RAGE, FLOTSAM AND JETSAM, STEEL ASSASSIN, TWISTED TOWER DIRE and many others), as well as a 2-week European tour in September including shows in Italy, Greece and at the Ages of Metal festival in Belgium (with MANILLA ROAD, DIAMOND HEAD, TYGERS OF PAN TANG, SPARTAN WARRIOR and others t.b.a. ).